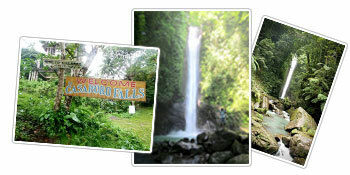 When in Dumaguete, Casaroro Falls is one of the must-visit places. It is located in Valencia, a neighboring town of Dumaguete. You can reach the place in about 35 minutes from the city center of Dumaguete via car or motorcycle. The trek going to Casaroro Falls begins with a walk down on a 350 steps stairway as the beautiful falls is lodged deep into the rock crevices of the Valencia mountains. Once you get to the bottom, you will have to walk through heaps of natural boulders to get to the famous waterfall. Enjoy the astounding height of 100 feet of the considerably and uniquely narrow waterfall. It is considered to be the province’s most photographed body of water. The water plunges into a deep cold basin before it flows down to a stream where bathers enjoy the natural water after a tiring trek. Pulangbato Falls is located in the Ocoy Valley in the town of Valencia, Negros Oriental - about 34 minutes drive from the city center of Dumaguete. 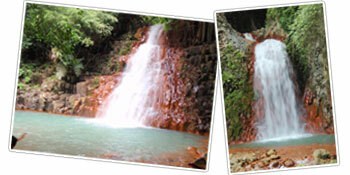 This beautiful falls is aptly named "Pulangbato" because it runs over brick-colored limestone rocks. Thus, the native words "pula", meaning red, and "bato", meaning rock. The water in the Pulangbato Falls appears to be in the shade of red too, perhaps only a reflection of these reddish rocks on the clear water on cloudless days. This natural waterfalls is one of the favorite getaways of both locals and tourists as it provides great swimming and diving hole for all ages. All you have to do is to climb up the rocks to take a dive into the water basin. The higher you climb, the more thrilling the experience will be. Alongside it is a swimming pool with smaller natural waterfall. However, unlike Pulangbato Falls, it is spared from the reddish rocks. Surrounding the waterfalls is thick foliage of wild plants and vegetation coupled with some trees. The ambience is rather calming in an unsophisticated kind of way because of the impression of being far from civilization. The Forest Camp Nature Resort is the one of the best places to go to when planning for camping, trekking, or nature swimming especially during hot seasons like summer because it shares the naturally cool climate in Valencia, a neighboring town of Dumaguete. "Forest Camp", as it is widely known, is situated along the curb of the Banica River in the remote town of Valencia, Negros Oriental. As a mountain resort, it offers rentals of their nipa huts for picnics, family cottages for overnight stay, and function hall. 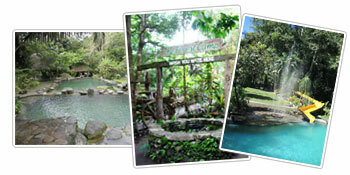 There are natural pools with slides, cascading waterfall, and beautifully landscaped garden. Trekking, rock hopping, trail biking, skating, wall climbing, ziplining, and horse backriding add to the fun there is in this resort. It is the only adventure park in Negros Oriental and offers a wide range of recreational facility: Segway (named by the resort as zegwee), F1 race zipline, bungee trampoline, and aquazorb. ATV Tours can also be availed which will take you to Valencia’s prime tourist destinations such as Casaroro Falls, Tierra Alta, Camp Lookout, Twin Falls Mountain, and Japanese Shrine. It takes pride of its river-fed pool and 2 large regular pools that basks at the feet of the mountains, surrounded by green trees and a river. 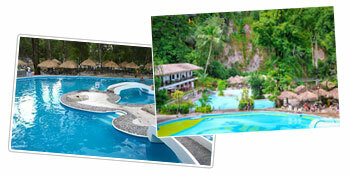 At only 60Php, one can use all of the 3 pools, and corkage fees are never a worry. It is not only a place to stay. It’s meant to thrill and leave you in spell-bind. We offer something beyond fun and adventure. We offer a range of awe-inspiring activities that you’ll surely love! Mount Talinis, also known as Mount Cuernos de Negros, straddles over the towns of Valencia and Dauin, both in the province of Negros Oriental. 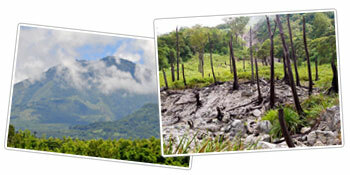 It is the second highest mountain in Negros Is. after Canla-on Vol. The Spanish phrase “cuernos de Negros” means “horns of Negros”. The “cuernos” refer to the two highest peaks of Talinis – the 1903-meter peak near Nailig Lake and 1700-meter peak near Yagumyum Lake. Some mountaineers from the neighboring island of Cebu are credited for introducing mountaineering in Mount Talinis in the early 1980s. Founded in 1988, the Cuernos de Negros Mountaineering Club (CDNMC) which is based in Dumaguete City (the provincial capital) soon took the role as the leading exponent of mountaineering in Talinis. With a wide swath of forest, four lakes and several “solfataras” including the famous Kaipohan, Mount Talinis is one of the most widely recognized mountains for mountaineers around the country. The Mountaineering Federation of the Philippines, Inc. (MFPI) recognized its potentials by holding its annual climb in Mount Talinis in 1990. 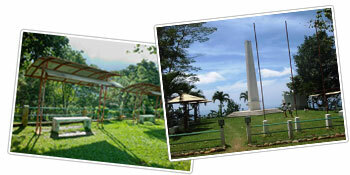 Perched high atop the hilly ranges of Valencia is the historical monument called the Filipino – American – Japanese Amity Shrine(Fil-Am Japanese Shrine). It stands on a sacred battle ground where an encounter during the World War II actually took place. It was built to remember the many lives taken by the vicious war. It was also to provide closure to a sad era and to mark the beginning of peace and friendship between the three countries. The commemorative shrine is actually a tall pillar with a solid concrete base. The pillar has three angles, making it appear 3 sided similar to a triangle. These three sides represent the three countries: Philippines, United States of America and Japan. In 1977 it was erected and unveiled by the war veterans, the surviving families of the water veterans, and the descendants of those who marched and died in the same war. Other people who were in a way a part of the war joined the unveiling ceremonies. The shrine was declared a historical monument shortly after it was constructed. Born on February 26, 1924, Porforio Cata-al is now an aging man who survived the grim episodes of World War II. 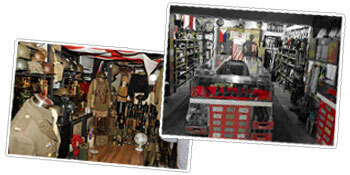 With a peculiar interest in the war that so shaped and changed the lives of many people like him (some unfortunate enough to have lost their loved ones), Porforio began his collection a little at a time until it became vast enough to fill his home which he now fondly maintains as a museum. The American – Japanese encounter brought about many pieces of interesting items that proved their existence in the province. The Cata-al War Memorabilia includes among other things, burnt remnants of an American militia uniform, ancient military armament, Japanese and American currency in notes and coins – all left behind by the fleeing as well as the conquering forces who once claimed the land. Perhaps the eeriest of all are the human skulls lining a shelf. They were dug up in the nearby mountains and believed to be casualties of the said war. 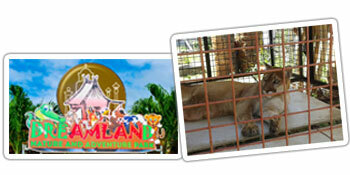 Amlan Zoo or DreAMLANd Nature and Adventure Park as far as world zoo’s go is tiny. But it is cheap and fun. Well worth a quick ride just North of Dumaguete for a little day trip. Very easy to find, if you ride North of Dumaguete on the highway, pass the Maayo Shipping Company to Cebu and then look for a large Petron storage tank and yard on the right, it’s right next to that. If you get to the town capital of Amlan you have passed it, turn back and ride for about 1km. After paying the 50 peso entry fee, you step forward to the bird aviaries. For 10 peso you can go inside and feed the birds. Hundreds of multi coloured small birds will take turns at eating out of your hand. Great fun, and a new experience for most. The camera got a workout early.